For quite some time it has been known that Robert Spencer, according to his own testimony, is a Catholic of the Maronite Melkite tradition. However what has not been discussed has been the extent of his involvement with the Church. Spencer attempts to portray himself as a “freedom fighter” (nothing could be further from the truth), fighting “Islamization” and the “savage” Muslims. Presenting himself as an “objective” scholar (though he has no qualifications when it comes to Islam) and a blogger while downplaying his other prominent roles in life. In light of the recent and welcomed news that the Catholic Diocese of Worcester disinvited Spencer from a speaking engagement at an upcoming Men’s Conference, it is clearer why he was invited in the first place: he is an active Catholic deacon. Robert Spenser, who is studying to be a Melkite deacon, recalls an old story of the emissaries who were sent out into the world by the Slavic king to investigate various religions, and happened upon a Byzantine church service in Constantinople. “We didn’t know if we were on heaven or on earth,” they would report back. “I think the idea of bringing heaven to earth, and having a taste of heaven on earth is one of the reasons people come here,” Spenser said. Associate to the Director of Educational Services – Robert Spencer of Manchester, NH. Robert Spencer is in the Diaconal Formation Program and has been active in the home-school movement. A 2006 discussion thread titled “Deacon Robert Spencer on C-Span tonight” on the Byzantine Forum leaves no doubt that Deacon Robert Spencer and JihadWatch Robert Spencer are one and the same. A 2012 PDF document from Our Lady of the Cedars lists Spencer’s ordination at the top of the masthead. Additionally, and this is perhaps the real question, it speaks volumes about the Our Lady of the Cedars Church. Why would they have someone ordained who is designated as a hate group leader? Why would they have someone in their ordained clergy who makes a living telling people that Muslims are violent criminals bent on destroying the West? Is this what the Catholic church is all about? I happen to believe it is not, especially considering that surveys of Catholic Americans show that the majority have positive views of Islam and Muslims. The fact that Spencer is out of step with mainstream Catholicism is also underscored by the fact that the National Catholic Reporter applauded the cancellation of his speech by the Worcester diocese. If anyone should understand what it feels like to be discriminated against based on religion, it is Catholics. They have faced a history of prejudice in the United States, thus it is odd that such a hostile, and at the least, very controversial figure would assume a leadership role in their church. And presumably, a portion of his income from his anti-Muslim rants goes to the church. There is one link that shows him as a “platinum” donator to a church function, and another one where he gives a “generous” gift to have a Pantocrator icon installed in the church. Update: Robert Spencer kneeling before the altar, decked out in full green regalia? Spencer here follows the example of the late Paul Weyrich, whom he regarded as a mentor-figure, although Spencer’s Melkite affiliation also reflects his personal circumstances: he is of Greek Orthodox heritage (family displaced from Turkey) and married to a Catholic, and so a form of Catholicism that follows an Orthodox style has obvious attractions. Some of Spencer’s books include the name of the priest of his church among the acknowledgements, although the church itself does not appear to promote the kind of anti-Islam polemicising for which Spencer is notorious. In 2006 Spencer promoted a report about a speech given by then-US Melkite leader Archbishop Cyril Salim Bustros, in which Bustros made criticisms of Islam; however, Bustros did not resort to the kind of rabble-rousing rhetoric and sloppiness that are Spencer’s hallmarks. Wrong. 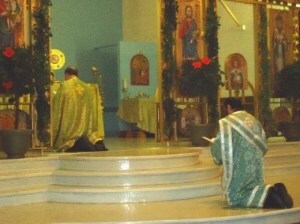 In the Eastern Churches, a married man may become a deacon or priest, but cannot marry after ordination. In the Orthodox Christian tradition, followed by the Byzantine Catholic Churches, which include the Melkites, a deacon is addressed as Father Deacon Firstname. In the same way, a monk, whether in orders or not, is Father Firstname, and a nun is Mother (not Sister) Firstname. Melkite Maronite is like saying Methodist Presbyterian. Now we know the depth of your knowledge about Eastern Catholic Churches. Casts a serious shadow over the trustworthiness and objectivity of the rest of your article. Wow, interesting title for his book! A step away from his usual, “what you really really need to know about Islam” tired titles. I agree, that’s definitely something you are going to see in any future articles on Fr. Rev. Deacon Robert Spencer. LOL. Now that would be a scoop, if Spencer and Geller were ever married. I do believe he will claim his life is at risk now that everyone knows his secret, but he already claims so any chance he gets. Well, Spencer does like collecting money. I think the church might do well to appoint someone to watch over him. You know, make sure he’s not skimming off the top to fund jihad watch or anything.